Wow! These look amazing! 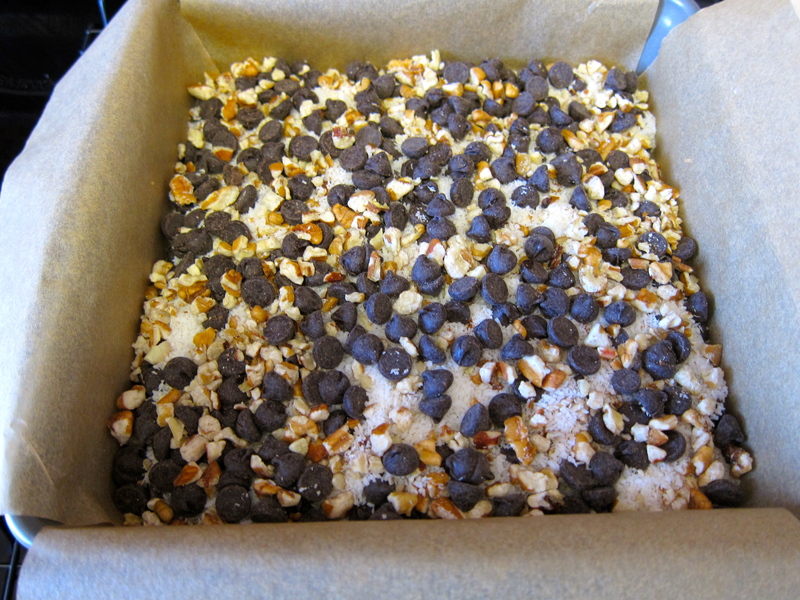 I used to love magic cookie bars before I stopped eating grains…I’m definitely going to give these a try! 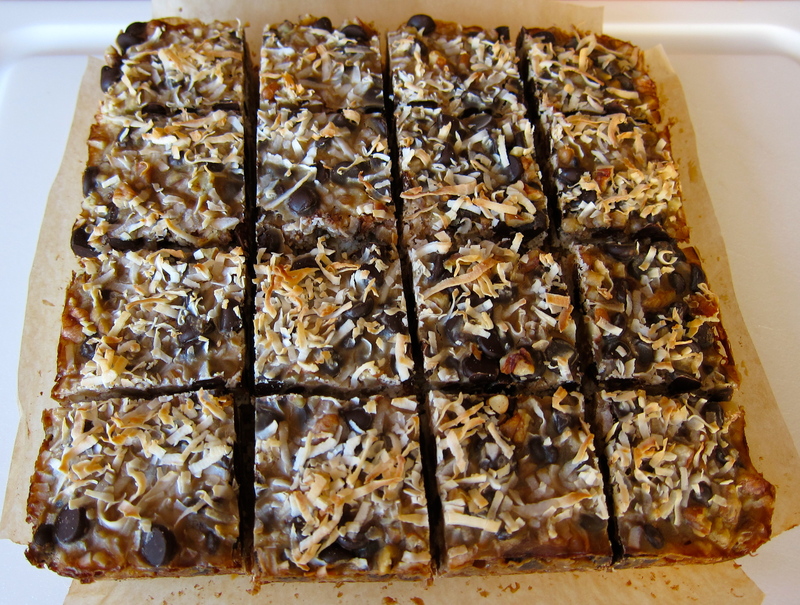 They really do bring back the memory of a traditional Magic Cookie Bar…very fun and satisfying! Full fat coconut milk is sooooooooo rich, what do you think would happen if one used light? Well the idea is to reduce the coconut milk down until it is thick and creamy like sweetened condensed milk so I’m not sure how it would work with light…I truthfully have never used light coconut milk so I’m unfamiliar with it. Although, I think it’s probably just a watered down version of the full fat so maybe just a longer cook time on the reduction process…let me know if you try it and how it turns out! You are right — lite coconut milk is just a watered down version of full-fat coconut milk and yet they sell it for the same price! So it’s basically a giant rip-off! OMG! I am drooooling! Have to have these…. now! Watch out! They are dangerous…I had to wrap mine up and give them out as Valentine treats to get them out of the house! They are SO good…very much a comfort food memory for me. Thank you so much for the recipe! These look and sound fantastic! I’ll have to substitute for unsweetened chocolate. I wonder if chia seeds would give and little chew to the coconut sauce…..Gotta go experiment! The chia may thicken the sauce but it certainly doesn’t need it once it’s baked and cooled, it holds together nicely. Another amazing recipe, this one is pinned! Please share at Allergy Free WEDNESDAYS IF YOU GET TO IT, THIS IS AWESOME! I will, thanks! This is by far one of my favorites! btw, I am your newest follower, I keep stumbling upon your recipes, so it must be a sign!! I’m glad you found me…your Loaded Smoothie recipe looks yummy! Oh WOW! Yummy!! I do think with the 45 minutes to reduce, I’d have to go ahead and double the batch – LOL! But I could freeze extra portions for when we wanted just a bit of dessert. Thanks for sharing! I agree…when you put in that much time it sure does warrant a double batch! These freeze and travel well, too! Holy cow, these DO look magical! Wow- these bars look great! Whenever I look at a new recipe I usually have to think of substitutions for things that I don’t eat but not with this recipe. All of the ingredients that you used are things that I cook with too. Thanks for the recipe! I am subscribing to your posts right now! You might be interested in some of the recipes on my blog too. Do you think these would freeze well? They look delicious and I can not wait to try them! Oh yes they freeze beautifully! I travel with them quite regularly…I wrap them in parchment and then freeze them…I usually pack them tightly in a container so they don’t slide around too much but they seem to be pretty sturdy and hold up well (I have even carried them from Denver to Dubai, 20+hours of travel, successfully!). I hope you love them as much as I do! I just pulled the crust out of the oven and am boiling down the coconut milk mixture. I don’t know how long I can wait – it smells amazing! I don’t have pecans, so I’ll be swapping them out for chopped macadamia nuts. I’ll check back in a few hours with how it turns out! Oh wow. I can see why you had to give some away! They’re delicious! Thanks so much for the recipe! It’s going on my “make for the holidays” list! I think it will be awesome with the macadamias! These are worth the work! I think I’d use a little less chocolate next time, and there will definitely be a next time. I made these tonight and yes, they are as good as they look! Thank you for such a great treat idea! Magic Cookie Bars are incredibly sinful and a caloric nuclear bomb — this version might still be high in calories but at least it’s WAY less sugar! This recipe doesn’t disappoint! By the way, I figured it out and they are 250 calories each (if cut into 16 squares). That is when using 100% dark chocolate (instead of regular chocolate chips). I just tried to make this and could not get the milk to cook down or get thick. I had it on med heat and when it boiled turned it down to low to simmer. What did I do wrong? Did you use Full Fat Canned Coconut Milk? How long did you simmer it? Yes, I simmered it for like 90 min before I gave up. Good grief…I have no idea as I’ve never had it not work…I have had it take longer than an hour before but it has always worked in the end. What brand of coconut milk did you use? do you mind telling me the ingredients in the coconut milk??? I’m totally puzzled by this! I hope that works better for you! Be sure to let me know!!! Just made these and all I had was coconut cream. Simmered for 50 min and didn’t get thick. Used some arrow root and thickened right up. Worked like a charm. I had the same issue with it not thickening after about an hour or so, I used it anyways and the bars still turned out tasting great (I found my base crust to be a little crumbly – but maybe that had something to do with the consistency of the milk. Will try the arrow root next time if I have the same issue. Thanks for the great recipe. Can you use GF all purpose flour instead of the almond flour? can you use coconut flour instead of almond flour? I just found out I cant have almonds. How funny you commented on these, they are cooling on the stove right now! You couldn’t sub it one to one for the nut flour and you will need to add egg or egg white. Not sure how much though… Could you sub another nut flour? It would be great with pecan meal. These are soo good. Since going Paleo, I have been craving a satisfying treat. This is it. I used walnut because I was out of pecans. Also, the wax paper stuck to the crust a little? Loved it. I am allergic to almond. Is there an alternative to the almond flour? If you are not allergic to other nuts I would use pecan or hazelnut meal…or you could use any of your favorite shortbread type crust in place of the nut crust. So good! I’ll make these again and again. I used half coconut milk and half coconut cream to reduce the reduction time. I still can’t believe this yummy, chewy dessert won’t make me break out! I am just finishing up my first attempt at these, but I substituted 1 T of agave, some erithrytol and a tiny bit of stevia. Unfortunately, my coconut milk never thickened up enough, so I ended up adding a little guar gum. I’m not loving the consistency of the mixture, but it seems to taste good. Keeping my fingers crossed! 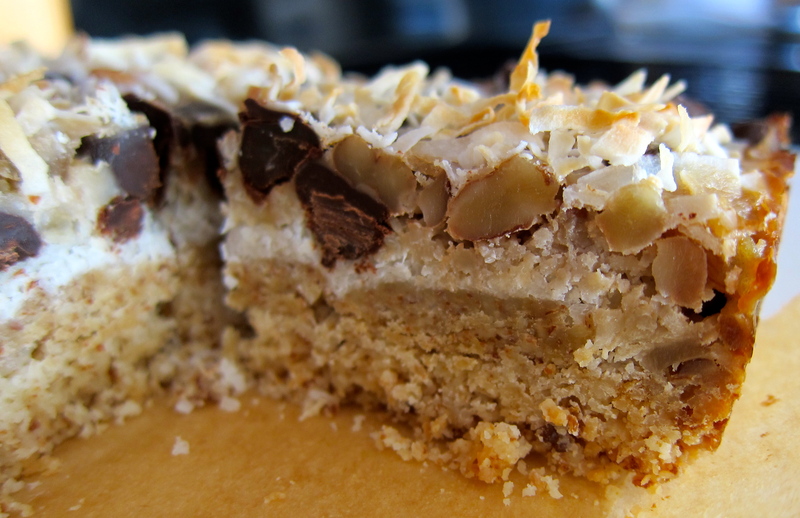 do you add the coconut milk to only the cery bottom and the very top? im a little confused since the firections say do a second layer, just of the add ins right? Yes, one layer of coconut milk (1/2 of the recipe) directly over the crust. 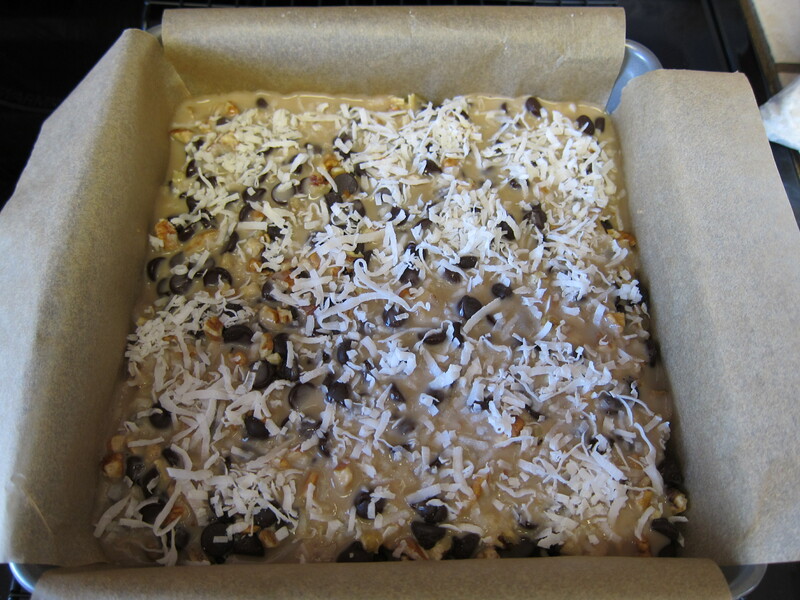 Then two layers of toppings and then the rest of the coconut milk over the entire thing. If you are going to have a “print” button can’t it at least ONLY print the recipe and not the 12 pages of comments? Annoying and wasteful. Sorry about that but this is a personal blog and not a paid website the PRINT feature is not an addition that I can edit or remove. In the future when you choose to print a recipe may I suggest that you preview the print in your settings and just select the pages you would like to print…I have had to learn this the hard way as so many bloggers do not have a dedicated recipe print feature…mostly the bigger blogs that have a lot more traffic and pay to have their sites run/monitored/advertised have that available. These were so amazingly delicious! Definitely worth the time! I love this recipe! 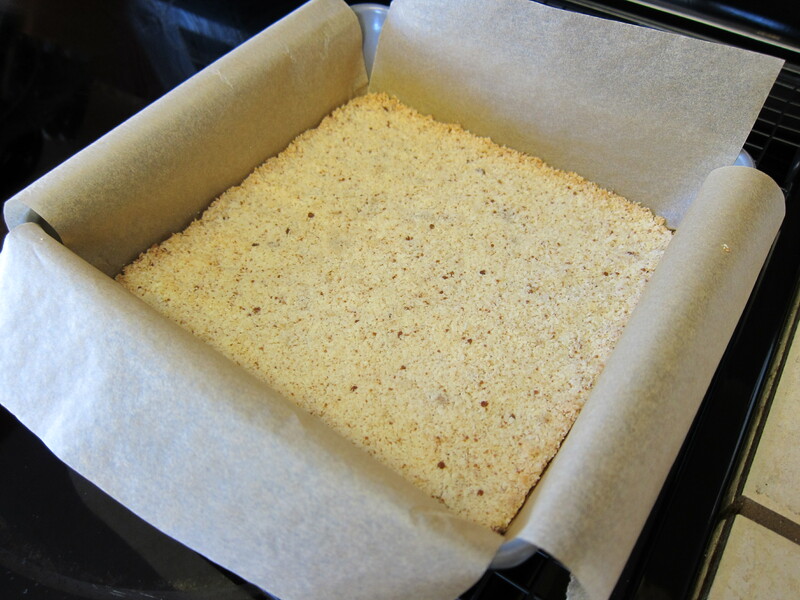 I have made these bars several times and they perfectly satisfy my sugar cravings without being overly sweet. It also has a slightly salty taste which makes these even more awesome! Each time I’ve made this though, I do have to heat the coconut milk mixture on the stove for about twice as long as mentioned in the recipe. I wish I could figure an easier way to do it and measure the coconut milk sauce while since in the pan. These are a little time consuming but I usually double the recipe and freeze a pan for later. They are well worth the effort!! Love them, thank you! Soooo good. Yes, they are time consuming (since you are making your own vegan condensed milk) but so worth it. My daughter LOVES them!! What brand of coconut flakes do you use? I use Tropical Traditions or Let’s Do Organic. Hi, would these be considered low carb? Most of the ingredients, are what I’ve been using..except the nectar, honey and maple. Love ‘magic bars’..so hoping i can add this to my low carb Fav’s! Yes, I would consider them a low carb treat. Enjoy! Everyone loved these bars! Reducing the coconut milk took more like an hour and 15 minutes but it was well worth the extra time.